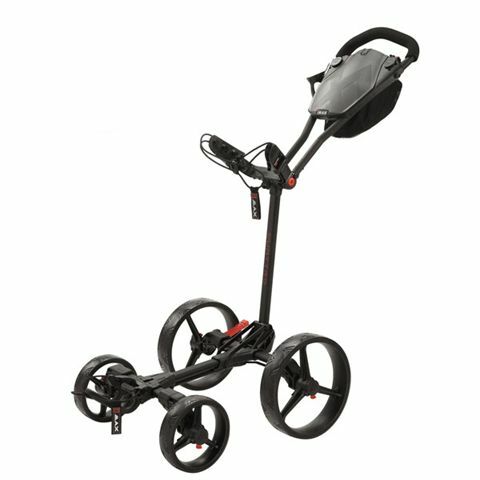 The Clicgear 3.5+ golf trolley features many improvements when compared to the previous model including a new, better lock brake system, an 80% bigger storage net, a larger adjustable cup holder and an improved umbrella holder bracket, all used to provide the golfer with an easier access to the necessities and more space to store them. It also comes with an improved bag strap system for an easier and more secure transportation of the gear. 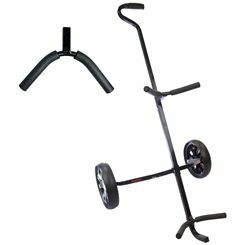 The trolley has a quality construction with an extra deep console and 4 tabs on it for easier mounting of accessories. It is also equipped with a mesh pocket that is ideal for storing additional accessories. 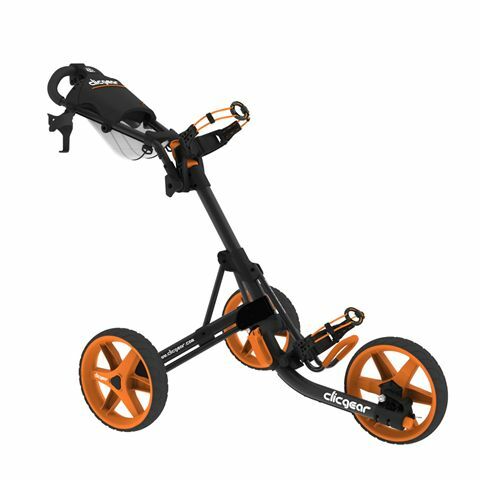 The Eze Glide Cruiser golf trolley has an easy push design to reduce strain and is equipped with 10” (25.4”) true glide ball bearing wheels for a straight and smooth glide across the course. 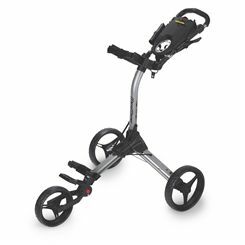 A wide axle of the trolley ensures extra stability, while a height adjustable handle with a soft grip enables customisation and comfortable pushing. 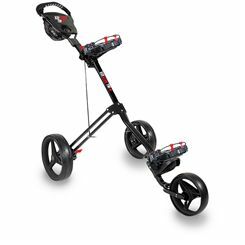 The trolley incorporates a foot brake and a multi-function console for holding all necessary accessories. It features a 2-stage easy fold design. The Longridge rental golf trolley has a solid and durable construction with a robust steel frame and wide 11" (27.9cm) wheels with bearings ensuring increased manoeuvrability and stability. For added comfort, there is a removable handle and bag bracket and the trolley is lockable overnight which makes it perfect for rental. Plus, the trolley comes flat packed for easy and comfortable storage and transportation. It is supplied in a black colour. 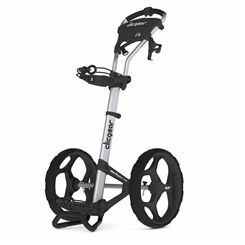 The Eze Glide Tri Plus is a lightweight (5.8kg) golf trolley with a solid, rugged construction and a tough, durable frame. 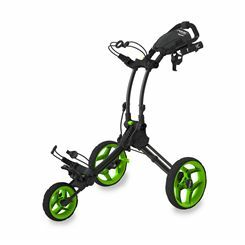 This 3-wheel trolley has an easy fold mechanism for fast and convenient storage and there is a soft grip, ergonomic handle with adjustable height making the Tri Plus suitable for golfers of different heights. A multi-function console is perfect for storing all the necessities and a safety foot brake helps to hold the trolley securely in place even on uneven ground. 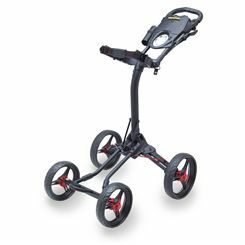 Additionally, for easy manoeuvrability and a smooth glide on all types of terrain, there are 29.2cm (11.5'') back wheels and a 24cm (9.5'') retractable front wheel. 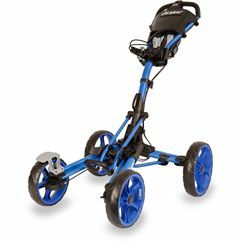 Here at Sweatband.com we stock a range of the latest and best golf trolleys and golf products, giving you a fantastic choice at the best prices. 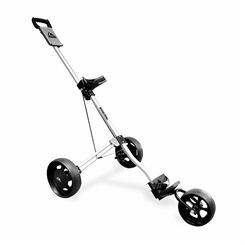 You’ll find manual push/pull golf trolleys, electric trolleys and golf trolley extras, from recognisable golfing brands including Longridge, Clicgear, Big Max and more. 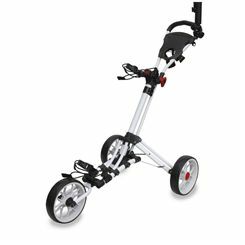 Whether manual or electric, golf trolleys are a very handy piece of kit to take onto the golf course. A trolley will carry your bag and other equipment for you, reducing the amount of energy you exert going from hole to hole and between strokes, allowing you to feel less tired and focus more on your performance. 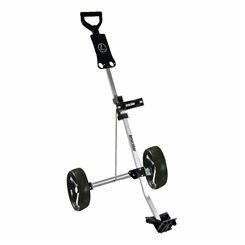 More basic models offer great value for money and a very cost effective way to add a trolley to your range of golf gear. 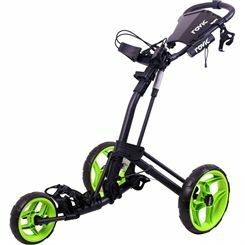 They will generally have two or three wheels, let you push or pull your golf bag and usually offer a holder for your tee, ball and scorecard. 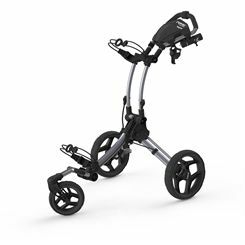 Other models may well offer more storage options for accessories, such as umbrella holders, a drinks bottle, your range finder or a towel, and have up to 4 wheels. 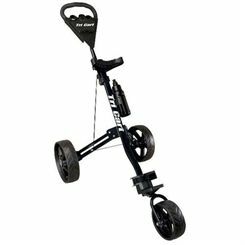 Electric trolley makes life on the golf course even easier by making the trolley do the work for you. 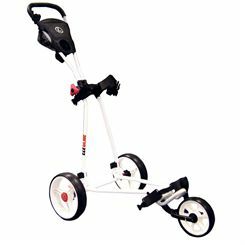 Thanks to compact designs and a folding mechanism, storing and transporting your golf trolley needn’t be a hassle. They are made to fold up so you can easily put it in the boot of your car and store it more space-efficiently at home. To begin browsing our range and finding the perfect trolley for you, scroll up this page, and you can use the filters to sort results by trolley type or brand.